Tritha Electric, an Indo-French fusion band, after touring 16 countries, is currently on a nationwide ALLIANCE FRANÇAISE TOUR in India where they are touring 8 cities for concerts that are being held to celebrate the International Francophonie Week. The band’s distinctive music is inspired by German Krautrock of the 1970s and Indian folk melodies that mixes classical music with psychedelic rock that created a unique mix that has connected very well with audiences. After touring more than 16 countries, the band is currently touring India. After successful concerts in New Delhi, Bhopal and Chennai last week, Tritha Electric is all set to perform in North India with Chandigarh being first on the list on 31st March 2018, followed by Dehradun on 2nd April 2018. The band will also perform in Trivandrum on 4th April 2018. Tritha’s first album, PaGLi released in 2014. PaGLi, which literally translates to ‘Mad Woman’, aptly described the songs in the album. Fish Market, a track with chaos and eccentricity, much like its album name, was one of the album tracks that gained quick popularity. The release of the album saw the band take off on an 18-month tour which saw the band perform over 100 shows across three continents, it is at this point that the trio became officially known as Tritha Electric. The band released their debut album Raagas in Paris on Indian label Silk Road in 2017. Raagas in Paris was named because of the band recording the songs at a studio in Paris. The album, unlike its predecessor, does not feature the mayhem of the above-mentioned songs from PaGLi. Moreso, it brings out a calmer, subdued side to Tritha’s voice. Other than Bong Voyage, which took Sebastien Cotheillas on board, all songs in the album have been composed by Tritha, Paul Schneiter and Mathew Durand. The band’s performances focuses on the themes of freedom, women empowerment, and social and environmental consciousness combined with lyrics involving ancient classical raagas and folk compositions. Much of their songs’ distinct German Krautrock style can be credited to Mathias’ flamboyant style of playing his electric guitar. Rangamati, a fan favourite, released in August 2016 as a music video and gathered more than 50,000 single views in the first week following its release. Notably, all lyrics have been written by Tritha Sinha, except Yaman Rhapsody which consists of two classical compositions dated many centuries back by an anonymous author possibly in the 15-16th century and Radha's Fantasy which has some words taken from a Baul folk song Kolonkini Radha. 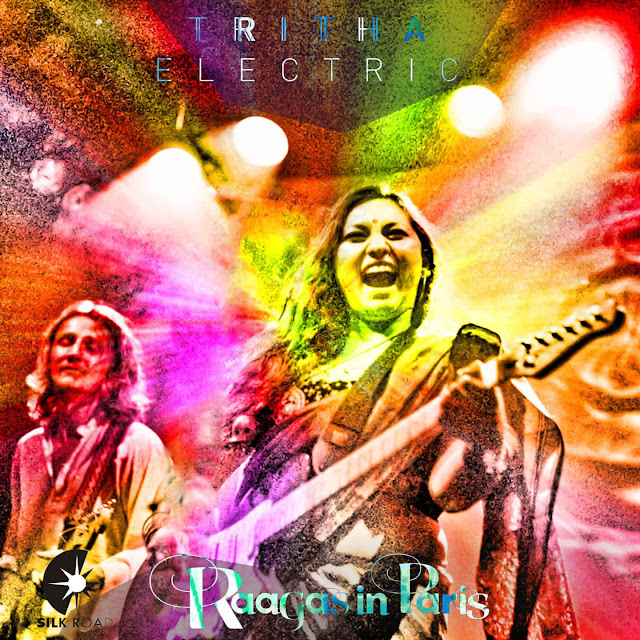 Tritha Electric was started by classical vocalist Tritha Sinha and drummer/producer Paul Schneiter in 2010. Known for its unique music and equally quirky album names, Tritha Electric gained quite a fan base in Europe and Africa where the rock music drew the audience attention and Tritha’s classical notes mesmerised. The band attained musical maturity when Mathias Durand, a guitar and piano virtuoso equally at ease with Western and Indian classical music, joined the band in 2012. To know more about Tritha Electric, you can visit their website at www.tritha.com. Listen Raagas in Paris on Saavn and Tritha Electric on Apple Music.